Here I describe how to create a pentesting or security research virtual laboratory on your own laptop. Using it you can master your pentesting skills and stay reasonably secure yourself when you do it. Security of the lab is important, because a lab typically contains either vulnerable software or malicious software. You want to isolate your machine and network reasonably from the lab. It also can be that a system you test is both vulnerable and malicious, but you do not know about it yet. This article is brought to you in the shape of a manual. It is a bit boring to read I guess, but contains all the steps you need to set up the vlab. Below we consider a case of a pentesting environment with a virtual machine image taken from vulnhub. We give concrete instructions below to setup Quaoar vulnerable machine from Canadian Hackfest 2016. Step 0. Install KVM and virt-manager (we assume Ubuntu). select the Virtual Networks tab, and click + to add a new network. Name it so that you can distinguish it easily later. I named it webhack01. Note: This address space depends on the settings of your vulnerable machine. The one used below wants to have 192.168.0.190, so we defined the network accordingly. 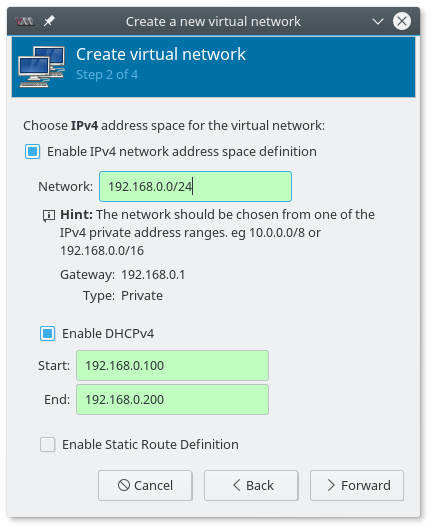 Select the type to be (o) Isolated virtual network. Next, find the image and import it. Browse - Browse local - navigate, select the qcow2 file. You can also select OS type Linux - Ubuntu 10.10 - for example. IMPORTANT: do not blindly click on the Forward without reading the settings! On the tab where you give a name to the new machine (can be anything you like), please, click on the "Network election" and select the webhack01 network we created in the step 1. Create a new VM from the ISO, follow Kali Linux installation instructions. We need to connect the kali to the target machine. For this got to settings page of the machine, and add a new NIC there. Add Hardware - Network - Select webhack01 network. You another network card might be a NAT card configured by default. You should be able now to reach form Kali the target machine and start hacking! So where was the security of it all? We have isolated a potentially malicious machine from our network by creating an isolated network and letting it interract with Kali only. Of-course, if your Kali is vulnerable, e.g. has ssh access enabled with a weak password, things might still go south for you.